Great Place to Live in Paradise! 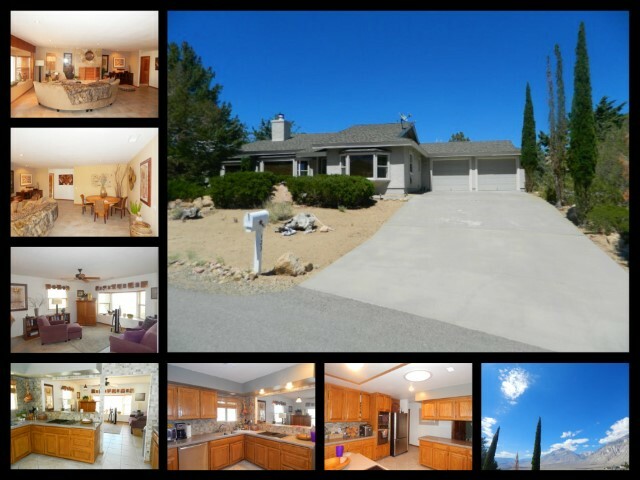 123 Scott Road is located in the Paradise Area, located outside of Bishop California. This friendly neighborhood is great for people who like open land and breathtaking views. This home has everything that you need to live in Paradise. The large open living room has plenty of views from the south facing picture windows. The updated kitchen is a cooks dream. Stainless steal appliances, including a double oven, an abundance of counter space. The home offers 3 bedrooms and 2.5 baths with tiled flooring throughout. A 2 car attached garage is conveniently located on the east side of the home. Entering from the garage is near the half bathroom and laundry area, if you come dirty from the trails. Homes in Paradise are known to have amazing views and this house is not an exception. Just walking out the front door, you get breathtaking views of the Sierra Nevada Mountain Range, and Valley. This home has low maintenance and drought friendly yards in the front and back. Pavers located in the front which are great for seating and a place to put your barbecue.